Introduction: Adolescents' tobacco usage is a serious health concern. Advertisements in mass media are influential for initiating tobacco use in youth among India. Advertisements and promotional activities for tobacco lead to initiation and progression of tobacco among Indian adolescents which have been reviewed for tobacco prevention and cessation. Aim: The aim of the study is to summarize the effect of glorified advertising among teenagers. 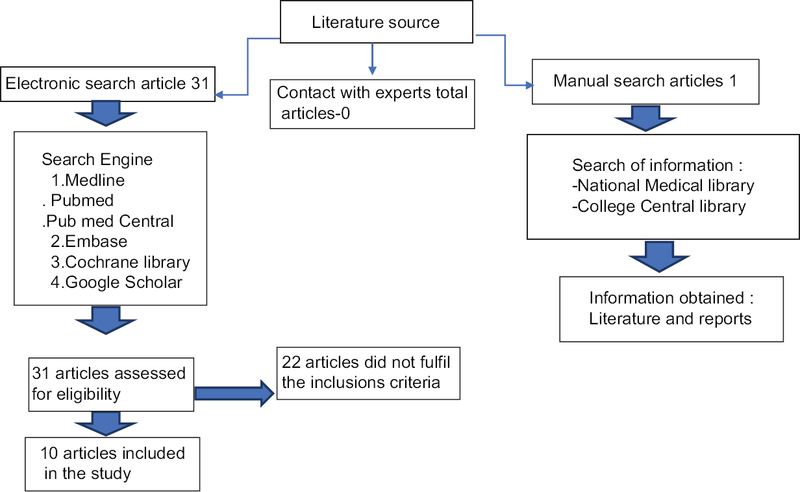 Methods: Electronic database was searched to identify suitable literature using Medline, PubMed, EBSCO, Cochrane library, and Google Scholar. The search was focused on studies examining the influence of advertisements and promotional activities of tobacco use among adolescents. Results: The search resulted in 31 articles, of which 10 articles fulfilled the inclusion criteria and were included in this systemic review. These studies were conducted in India from 2005 to 2016. Glorified marketing and advertising of tobacco play a significant role in tobacco initiation and experimentation of tobacco intake among adolescents. Conclusions: Glorified advertising traps the vulnerable adolescents for tobacco usage. They develop normalcy toward tobacco usage through attractive advertising. Measures such as banning tobacco usage in movies and television should be strictly implemented as youth get easily trapped in the influence of movies and television. Cigarettes and other Tobacco Products Act should be strictly implemented. All the loopholes in the legislation should be evenly covered. Introduction: Teeth wear (TW) an otherwise physiological process if present above acceptable level might cause a debilitating effect on the quality of life (QoL). With increasing life expectancy and people retaining their natural teeth into old age, the problem of wearing off of teeth over time poses a major public health concern. Aim: The aim of this study is to identify the prevalence of TW and its effects on individual QoL and satisfaction with their dentition. 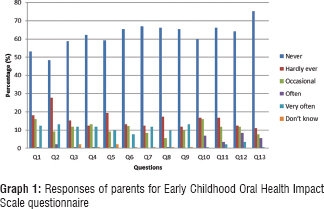 Methodology: A cross-sectional descriptive study was conducted among 650 individuals selected from Sullia Taluk, Dakshina Kannada district, Karnataka, India, to assess the prevalence of TW as determined by teeth wear index (Smith and Knight, 1984) and impact of the same on oral health-related QoL on 240 individuals with TW (39.15 ± 3.05 years) measured using a translated version of Oral Health Impact Profile (OHIP)-14 questionnaire. Results: Analysis revealed that 39.97% of the study individuals had a TW severity of score 2 and TW severity of score 3 were observed among 20% of the study participants. The overall mean OHIP-14 score of the study population was 16.91 ± 8.07 with 36.7% moderately and 0.8% severely affected impact on OHRQoL. Physical pain, psychological discomfort, physical disability, and psychological disability with respective mean values of 1.47 ± 1.3, 1.18 ± 1.07, 1.85 ± 1.5, and 1.53 ± 1.3 were the main affected domains in oral health QoL. Conclusion: The severity of TW in the study population was score 2 having moderate impact on the QoL with physical disability, physical pain, psychological discomfort, and disability as the contributing factors. Background: Oral diseases are identified as one of the most common of noncommunicable diseases affecting varied population. It is an important public health problem owing to the prevalence, socioeconomical aspect, expensive treatment, and lack of awareness. Aim: The aim of the study was to assess oral health status and treatment needs among teaching and nonteaching employees of a deemed university. Materials and Methods: A cross-sectional study was carried among employees of the deemed university and systematic random sampling was employed for the selection of study participants. A total of 400 employees were included in the study. Demographic details along with medical history and history of deleterious habits were obtained from the participants by direct interview. Clinical examination was carried out according to the World Health Organization Oral Health Surveys 2013. Statistical Analysis: The data so collected were analyzed using SPSS Software Version 20.0 (Chicago, USA). Means and proportions were compared using Mann–Whitney U test and Chi-square test, respectively. Results: A total of 400 participants, 237 from teaching and 137 from nonteaching were included in the study. The prevalence of dental caries was 78.7% among teaching faculty and 86.1% among nonteaching staff. Of the total sample, 48.7% (195) and 48.0% (169) self-reported dental needs and need for dental treatment, respectively. 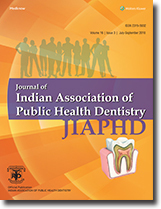 Conclusions: From the present study, we conclude that a statistically significant difference in the prevalence of dental caries, intervention urgency, and utilization of dental services was observed among the teaching and nonteaching staff belonging to different socioeconomic status and educational qualifications from different institutes within the deemed university. Background: The influence of location and type of school on dental care seeking behavior has not been adequately investigated. The objectives of this investigation were to determine whether the location and type of school enrolled in influenced dental care-seeking behavior among school-going adolescents. Materials and Methods: Public and private high schools in urban and rural areas of Mangalore taluk were selected through stratified cluster sampling. Sample size was determined to be 1340; after obtaining necessary permissions, data were collected on dental treatment obtained in the past, details of obtained treatment, facility where treatment was obtained, and its distance from place of residence from students who fulfilled the inclusion criteria. The Chi-squared test was used for analysis with the significance level set at P < 0.05. Results: Dental treatment history was reported by 35.6% respondents. More private schoolchildren had obtained dental care (P = 0.005). Restorative care was most frequent treatment modality obtained. Higher number of private school students received treatment at dental clinics, while public and rural schoolchildren seemed to prefer dental schools (P < 0.001). More private and rural schoolchildren traveled more than 5 km to obtain dental care (P < 0.05). Conclusions: Children enrolled in private and rural schools formed a large component of those who had obtained dental care, were more likely to obtain restorative treatment, and traveled considerable distances to obtain care. Introduction: Inadequate knowledge of handling biomedical waste (BMW) may have serious health consequences and a significant impact on the environment as well. Judicious management of waste is not only a legal necessity but also a social responsibility. However, extreme laxity in the implementation of rules coupled with inadequate training of healthcare personnel leads to indiscriminate disposal of biomedical waste. Aim: The aim of this study is to assess knowledge, attitude, and practice (KAP) regarding BMW management and to determine the correlation between KAP and professional category. Materials and Methods: A cross sectional study was conducted among 168 healthcare personnel. A predesigned and pretested structured 34 item questionnaire was used for data collection. A self made scoring system was devised to categorize KAP as good, average, and poor. Data entry and analysis was performed using SPSS version 20. To determine whether there was any correlation between KAP and professional category Spearman's rank correlation coefficient was computed. Value of P < 0.05 was considered to be statistically significant. Results: KAP were found to have a significant positive correlation (P = 0.002, 0.04, and <0.001, respectively) with the professional category. Conclusion: The need for comprehensive training programs regarding BMW management is highly recommended to all hospital staff. Background: The role of sugars on health and specifically on oral health is well evident in scientific literature. However, information regarding sugar portrayal in print media is quite limited. 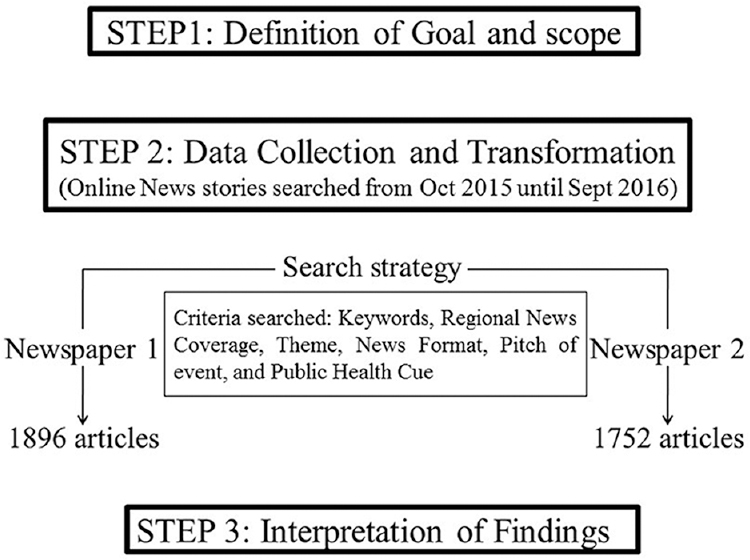 Objectives: To determine “Sugar Portrayal” in English newspapers (online version), a 1-year media content analysis of newspaper stories from Delhi (India) was conducted. Methods: Media content analysis was conducted by an online search for news stories in the two most popular Delhi English newspapers for daily and their Sunday equivalents. A total of 3648 newspaper articles and opinion pieces appearing over a period of 1 year (October 1, 2015, until September 30, 2016) were retrieved after entering selected “keywords.” The articles were reliably coded for overall frame and type of article. The data were entered in MS Excel and analyzed using SPSS version 21 (IBM Inc., Chicago, IL, USA). Results: It was inferred that the print media generally advertise sugar recipes and industry, invariably in state-wide context with either a negative or neutral slant. Although there was mention regarding benefits as well as harmful effects in the news stories, yet coverage often lacked detailed health information. Conclusions: The current study found out that there was relatively wider state-wide coverage of sugar, with very narrow focus on public health facts. More accurate information would permit the individuals to make more informed decisions regarding their own behavior. Background: Positive health outcomes are a result of effective physician-patient communication and assessment of the attitude of dental students toward learning communication skills may help dental educators to devise effective plans to orient students toward learning communication skills and make proactive efforts to hone their skills. Aims: The aim of this study is to assess the attitude of dental interns toward learning communication skills. Materials and Methods: A cross-sectional study involving 400 dental interns involving both males and females were selected from various dental colleges in Bangalore city for this study. Data were collected using the dental communication skills attitude scale, which consists of 24 items, 13 indicative of positive attitude and 11 indicative of the negative attitude toward learning communication skills. Statistical Analysis: The positive attitude scale and negative attitude scale scores were calculated and compared among different groups using SPSS software version 22. P < 0.05 was considered to be statistically significant. Results: Out of 400 participants, 150 (37.5%) were male and 250 (62.5%) were female. There was a significant difference in mean score of positive attitude between males (52.4 ± 5.6) and females (51.1 ± 6.0) (P = 0.03). The mean score of negative attitude was significantly higher among students whose teaching language was other than English (31.9 ± 5.1) when compared to students whose teaching language was English (29.8 ± 5.0) (P = 0.03). Conclusions: Dental interns have a strong positive attitude toward learning communication skills; however, negative attitudes should not be ignored, as they may subdue the importance of such programs. Background: Awareness regarding oral diseases and its prevention aids in the development of correct oral health practices, thereby controlling oro-dental problems; hence, this study aimed to evaluate the level of oral health knowledge pertaining to its causes and prevention among higher secondary school students in Walajapet, Vellore district, India. Materials and Methods: The survey was carried out among 400 schoolchildren who were in the age group of 16–18 years studying in various schools of Walajapet in Vellore district. Data on knowledge about oral diseases were collected by means of self-administered questionnaire. The results were analyzed by descriptive statistics and Chi-square test using Statistical Package for the Social Sciences version 19. P < 0.05 was considered statistically significant. Results: A total of 400 secondary school students with an age range of 16–18 years and mean age of 17.2 ± 10.44 years participated in the study. About 324 (81.0%) secondary school students had adequate level of knowledge on causes and prevention dental caries, 267 (66.7%) school students were aware of causes and prevention of periodontal diseases, only 195 (48.7%) school students had awareness on cause and prevention of oral cancer, and 305 (76.2%) students were familiar with causes and prevention of dental malocclusion. Conclusion: Majority of schoolchildren showed adequate knowledge toward causes and prevention of dental caries, periodontal disease, and dental malocclusion but had inadequate knowledge toward oral cancer. Background: Dental Council of India in its 3rd amendment regulations-2011 had incorporated 3 months of compulsory rural posting for the dental interns to sensitize them toward social responsibility through community outreach program. 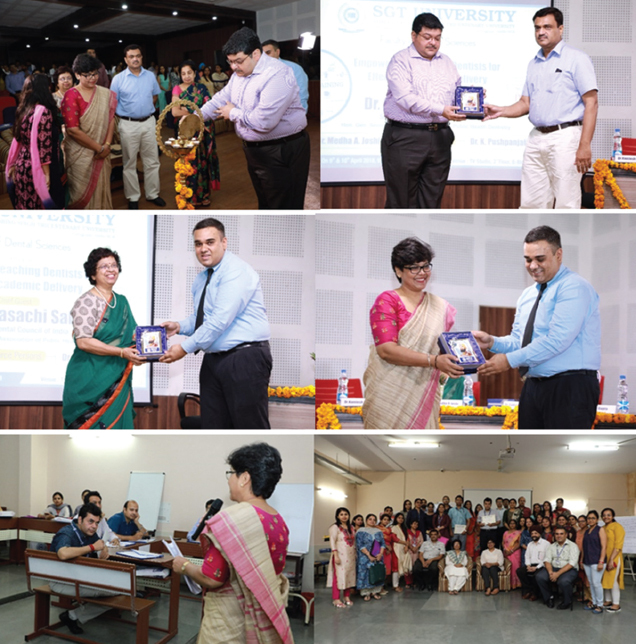 Objective: The objective of the present qualitative study was to understand in-depth the perceptions and attitudes of the interns of dental colleges in Pune district, India, toward community outreach programs. Materials and Methods: Focused group discussions were conducted for each group of ten interns separately in one college for about 1 hour, based on a well-designed but flexible topic guide through a moderator and a note-taker. Results: Most of the interns were aware of need for outreach programs in the community. It helps the interns in sharpening their clinical as well as communication skills outside the traditional dental school settings. Since most of the dentists prefer to practice in urban or financially stable areas, such programs can increase the exposure of dental students to underserved population and sensitize them toward their oral health needs. Conclusion: Thus, dental profession must develop strategies to provide new graduates with professional and personal support to retain the rural dental workforce. Background: Adolescence is a period, wherein teenagers try various mannerisms to acquire what best suits them. The Global Adult Tobacco Survey, India (2009–2010), reported that among the minors (15–17 years), 9.6% consumed tobacco in some form which cannot be ignored. Thus, there is an utmost need to protect the future generation from the gripping hands of tobacco and plan effective strategies to reduce its intake. Objectives: The aim of this study is to assess the perceptions and practice of tobacco use among the adolescent students of Mangalore city. Materials and Methods: A structured, close-ended questionnaire study was designed, and data on tobacco usage were collected from 407 students aged 15–17 years, studying in various preuniversity colleges of Mangalore city, who had enrolled in Tobacco Free Kids Campaign. Data obtained was analyzed using SPSS version 16.0, and descriptive statistics was applied. Results: Out of the 407 children, 102 (25%) have tried cigarette smoking, while 7.9% have tried smokeless tobacco. Almost 14.3% of them attempted to buy tobacco products and the shopkeepers sold it to them. A major proportion of the adolescents, 81.1% of them, believe that smoking can definitely cause harm to health, while 66.1% of them were aware about the harmful effects of passive smoking. About 73.7% were in favor of the idea of banning smoking in all enclosed public places. Conclusions: The adolescent students of Mangalore city are relatively well aware of the ill effects of tobacco, but a small proportion of them still use tobacco in some form which cannot be ignored. Background: Rapid increases in dental knowledge and associated technologies, a growing integration of evidence-based practice into the curriculum, and shifting faculty roles (from lecturers and content experts to facilitators) have profoundly altered dental education. Aim: The aim of this study is to assess the usage of social media and its influence on clinical practice among dental faculty members of dental colleges in Davangere city. Materials and Methods: Descriptive cross-sectional survey was carried out among the convenience sample of 88 dental faculty members of two dental colleges in Davangere city. An investigator-designed questionnaire comprising 15 close-ended questions related to the usage and various aspects of the influence of social media was used as a tool in the present survey. Ethical clearance was obtained from Institutional Review Board of Ethics committee of college. Descriptive statistics were generated regarding frequencies and percentages. Results: Among the participants, 64.8% reported the use of social media in their profession. Around 62.5% used social media to exchange opinions and views regarding cases with colleagues. According to 39.8% of participants, it can potentially improve the quality of care delivered to patients. Conclusion: In the present study, dental faculty used social media for many reasons, but mainly to serve public and other dental professionals and to communicate with other dental professionals on social media. Since social media in dental education is still in its infancy, research should be undertaken to determine the optimal ways for incorporating these technologies into both traditional and e-learning courses. Introduction: The use of traditional medicine is well known in India. The high number of bacterial resistance to antibiotics drives much of the current interest in natural antimicrobial molecules. Spinacia oleracea (spinach) possesses medicinal properties. Dental caries is prevalent in about 89% of the Indian population. Streptococcus mutans is the primary causative organism for dental caries and Lactobacillus for further development of caries. Aim: The aim of this study is to determine minimum inhibitory concentration (MIC) and minimum bactericidal concentration (MBC) of aqueous and ethanolic extracts of spinach against S. mutans and Lactobacillus. Materials and Methods: About 10 g of freshly harvested spinach was extracted with 95% ethanol and distilled water. The extract was converted into dried powder in desiccator and was dissolved to get 20 mg/ml concentration. The MIC was determined by nine dilutions of each aqueous and ethanolic extracts made with brain–heart infusion. To determine the MBC, the MIC dilution tubes, with no visible growth, and the control tube were subcultured onto the broth media and incubated for 24 h anaerobically and the colonies were counted on the next day. 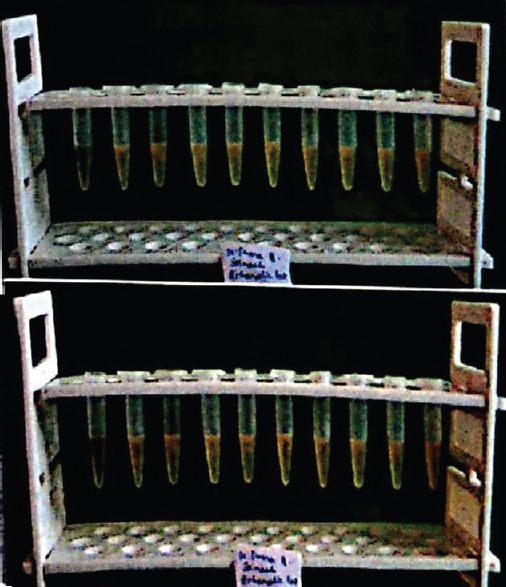 Results: The ethanolic extract exhibited MIC at 12.5 μg/ml against S. mutans and at 25 μg/ml against Lactobacillus. In MBC, the ethanolic extract showed greater bacteriostatic activity against S. mutans compared to Lactobacillus acidophilus. Conclusion: There is preliminary evidence for the antimicrobial activity of spinach extracts against S. mutans and this raises the possibility that spinach may have preventive effect on dental caries.